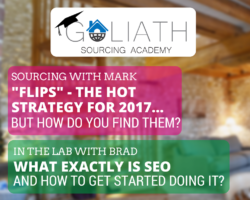 “Flips” – The Hot Strategy For 2017… But How Do You Find Them? Mark: Right, so as we alluded to earlier on, Richard’s question – Richard Haines’ question this session is with regards to direct mail campaigns and how best to address the envelopes. Now, there are key elements to direct mail campaigns and one of the main reasons we send direct mail is hopefully to get them opened and read. And, of course, the best way to get something open and read is to address it to the person’s name. So if we can get the person’s name – all the better, but what’s really important is that there are certainly much better ways, in terms of getting envelopes opened, dependent on the strategy that you’re sending. So a really important way of thinking about this, of course, is if you are sending letters to potential repossession cases – so people are maybe in financial difficulty, you’re targeting that sorts of demographic – the chances of an official looking envelope being opened reduces and the reason being, that what you tend to find is a lot of people in that position think that official looking envelopes with the printed address, the window envelopes and all the bar codes on the envelope, that sorts of thing, is an official letter maybe looking for more money off them. It might be a bill or anything else. So they ignore them, really. It’s sad to think but that’s what people do. They ignore these and put them in a – well, they probably don’t even put them in a drawer. They probably just throw them in the bin and never read them. So if you’re targeting people for that strategy, for the BMV strategy in maybe a lower income demographic area, what I would recommend is handwritten envelopes and potentially handwritten envelopes on colored envelopes. So this time of year red ones are quite good because they think they’re Christmas cards. You could even maybe write the – put the message on a card, fold the card in half and put it into the envelope. The chances are very high that that is going to get opened. We really approach most of our direct mail campaigns on a corporate basis. So we send the letters out to landlords, to people with properties currently on the market, So we actually send a letter is in window envelopes. I think that’s right Brad, isn’t it? All of ours go out in window envelopes with printed addresses. Brad: Yes, that’s right. Yes, we just can get more volume out. There is a school of thought that handwritten ones are better but, yes, I think the personal approach just on that… We’ve done the personal approach and corporate approach, but both are still with the window in the envelope which from our testing seems to have worked. Mark: Yes, and I think we’ve never really gone after these sorts of volume – send it into an area with, say, the lower demographic area and just carpet bomb the whole area, but I do know that people have had a lot of success from handwritten envelopes. You can even get it – weirdly, I got a Christmas card from a direct mail company that I’m speaking with at the moment and the envelope was a printed handwritten. Does that even make sense? Mark: Printed giving the impression of handwritten on the envelope with a Christmas card in it and I opened it up thinking, “Who’s this from?” I wouldn’t say I was disappointed that it wasn’t [laughs] from someone I knew, but it wasn’t [laughs] what I thought it was, but I opened it. And in opening it I also read it. And it was a nice touch We went into… I think we discussed Christmas cards last session, didn’t we? Mark: And I can tell everyone know that that Christmas card is not on my mantelpiece advertising the brand [laughs] in my house. That’s a demonstration of what we practice – what we say is what we preach. But yes Richard, back to the question – I would say that, if you’ve got time to hand write envelopes or you can go to some of these mail companies where they will do like a printed handwritten envelope, it certainly is worth a try. Brad: Or you can find someone locally. Mark: Yes, we’ll find someone locally too or you could even get your kids to do it if your kids’ handwriting is neat enough. That would almost be guaranteed to get open, but it could take you four weeks to send a direct mail campaign. Brad: [laughs] Yes, and there’s no guarantee it’s going to go where you want it to go. Brad: Particularly this time of year. Santa’s going to get our load of options for somebody to buy his [inaudible]. Mark: Be funny if he replied. [laughs] Santa’s going tough… And Amazon taking a lot of our business away. The other thing which I wanted to make really clear is the names. Anything with a name is much more likely to get opened than something addressed to the homeowner or to the residence or to the tenants or anything like that. So there are ways to get the names. There are websites such as tracegenie.com, is it tracegenie.com or .co at UK? Tracegenie, anyway. Brad: No, it’s Tracegenie and you might just Google it, yes. Mark: Yes, Tracegenie who we use, and then there’s also 192.com, where what they will give you is the most recent name on the electoral roll, if available, and who’s living in the property. So it’s a lot cheaper than getting the title deeds for every property and that’s three pounds a go. But if you can get the names all the better. Now, you’re not always going to be able to get the names or you might find if you’re writing to the homeowner and you know that the property’s tenanted you are going to have to somehow get that letter to the homeowner and a good way of doing that is making sure that you put something like “private” and “confidential” or “to be opened by the homeowner only” and make it – that is something where you might find it on a more corporate level might be more likely to be opened, but if you can get the name. If not, just try and do anything that will help make it more – look more urgent to open. And again, if you’re writing to tenants – so I know some of you are writing to tenants in order to try and get them to pass your details on to the landlords – a lot of tenants will register on the electoral roll, so you can get that information on the electoral roll information i.e. 192.com, Tracegenie. And again, I’d probably use a handwritten envelope and on a colored envelope, a hand written colored envelope for the tenants to open it and that should get you a much better response. So hopefully, Richard, that would give you a few different things to think about and keep us posted on how you getting on. It’s always good see how other people’s marketing – you know, we don’t profess to be the only marketing gurus in the world. So we’re always interested in hearing how people’s techniques are going. We know what works for us but it’s always good see what’s going around so please do post in the group. Brad: Yes, I think the thing about the – there’s always another way to connect or to engage or to ensure an audience or a market receives what it is that you’re sending. There’s always other ways to do and I think ultimately it’s about who are you sending this piece of mail to and what’s their mindset when they might receive it. And I think if you can think that through, you’re half-way towards knowing and understanding what type of direct mail piece you should be sending, because ultimately people will – there’s a very famous direct response marketer called Gary Halbert and he always used to talk about the fact that people sort their mail over the bin and you would – you’d literally have five or six letters and they would probably keep one or two of them, the others will just be thrown away. But you only throw that letter away if it’s something that doesn’t register in the receiver’s head that it is important and should be opened, so that’s just something to think about as you decide which of these ways to – which of these methods to use. Mark: Almost Covey’s seven – whatever it is? Mark: Seven habits – start with the end in mind. Mark: So it’s exactly the same with the marketing. Who you’re approaching? What do you want them to do? What’s ultimately the end result? And work your way backwards into what’s the best way that’s going to get response. Brad: Yes, I think you just need to – it just needs a bit of thought. It needs to be thought through, that’s the main thing and get into the – I always like the term “camp out in the mind of your market”. So literally sit, think how they might think. Set up camp for a few days and think through, how might a corporate landlord receiving a handwritten envelope – it’s likely to kind of spark his interest, but actually he’s going to be opening his mail anyway. Do you need to go to the effort of handwritten? You know, he’s going to be opening his mail with – you know, in terms of the way that we’re sending mail out, the moment with the window in the envelope – he’s going to be opening that mail. So it then becomes right, that’s the further job of that piece of mail, the job of that letter. Sorry, the job of the envelope and how it’s presented to him is only to get that person to open it. That’s the only job of that envelope. The next thing is you now then need the letter inside – it’s the job of that to get him to make contact. So each thing has its – each element has its job along the way and that just needs thinking through. Good are we – that was all good, we finished? Are there any other points to add? Mark: No, we are done. I think that covers everything, but again if anyone’s got any questions about it, get in the Facebook group and feel free to drop a line in there when we come back. Brad: Yes, absolutely. So Richard Haines, thank you for that. I had a chat with Richard the other day, actually. He was potentially interested in doing some content stuff for us. A firefighter, no less. Did you know that? Brad: Yes, absolutely. So if you’ve got a question, anybody else got a question, go to the Goliath FB group dot com and get into the Facebook group there and leave a message, get in. There’s over fifteen hundred people in there now. The conversation’s great, so you can learn a lot from that. Okay, I think we need to get on with the show and it’s more of Mark next in Sourcing with Mark. Mark: Hi everyone and welcome to this session of Sourcing with Mark and what I thought I’d do, seen as it’s the last Sourcing with Mark of the year, last of the season, I wanted to go into a bit more detail with regards to the hot strategy of 2017. 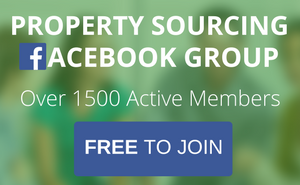 So the strategy that I really think is going to take off in 2017, it’s going to become a lot more prominent with property investors, it’s something that Goliath ourselves are focusing a lot of our attention on and can you guess it? Can you guess what it is? Flips. So we’re talking about buy, refurb and sell. We’re looking at primarily residential, but this is something that I know sources within our network and also from clients of ours, they are really starting to up the requests for flips. Now one of the big reasons for this, of course – single buy-to-lets are dying a death. The government are really penalizing. I say penalizing – they’re making life difficult for landlords as it stands. So investors are looking for better ways to get a return on their investment. We also have a lot more, in terms of money out there, that wants a quicker return. So not necessarily buying for capital growth, not buying and holding, but actually just making a quicker return. So that’s a good thing. Of course, we’ve got money who want to get quick money, so flipping is a great strategy for that. Another great thing for coming into the new year is that mortgage rates at an all-time low. They are remaining low and there’s also incentives for first-time buyers, but also people that are maybe upsizing, so they’re moving into a bigger property. What that means is there’s a lot more movement in that marketplace. So what that, of course, does for flips, is it means that we’ve got a very good chance price rate of selling that property on to an owner-occupier. So ultimately we buy cheap, we refurbish it to a very good standard, excellent standard and then we resell it at the maximum possible price to an owner-occupier who’s going to live in that property for a while. So that’s the reason I think flips are going to be a big, big strategy in 2017. Now the negative side of that, of course, is that there’s a lot of competition and there’s a lot of competition for, in relative terms, a fewer number of opportunities. Needless to say, the properties that we need to buy need a lot of work doing to them in order to maximize the return for our investors. So those properties aren’t in abundance. You’ve got to search maybe a little bit wider than your goldmine area. You might have to go a little bit further afield just to find those deals. The good thing about that though is that it’s not particularly as location-specific maybe as a buy-to-let investment or an HMO or a service accommodation deal. At flips, when it’s owner-occupied, you can pretty much buy anywhere as long as you know that properties are going to resell in the area. So you can go into a lot more affluent areas. You can offer more money to buy the properties. And the key really here is to be able to step away from the crowd and try and go into a higher bracket of investments. So not focusing on your 60, 70, 80k properties. 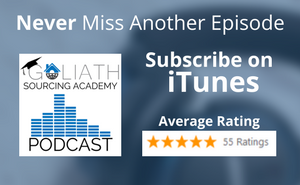 You want to be getting up into the 150s, 200s, 250000s and there are many ways of being able to buy those properties with little or no investment or working with JV partners, but that is for a completely other episode and not one I want to go into today. So, how do we find these flips? I told you – the fewer opportunities. So what I’m going to do is in this episode, I’m going to run through a few of the different ways of how to find these opportunities. Now, one of the obvious ones – estate agents. You’re going to have to work with estate agents if you’re going to have flipping as one of your strategies. You’re going to do exactly as we went through in our very first podcast of “How to work with estate agents?” We’re going to be phoning them every week. We’re going to be bringing them presents. We’re going to be giving them coffees, biscuits, sweets, whatever it is that builds those relationships up. You probably want to be building relationships with quite a few of the agents, if you’re going to go for the flipping strategy. Just purely because the properties, when they come in, you want to be that on the first – the call list for the first person that they ring. So just make sure you’re at the forefront of the estate agents’ minds and just remember everything that we went through in session one of the podcasts, our very first session. So I’m not going to go into too much detail about estate agents because I’ve gone on about that in quite a few episodes. The other thing we’ve got is because the buy-to-let market is not necessarily going as well, you’re going to have a lot of landlords that are trying to offload now. So you’re going to have landlords that have held the properties for a while. They’ve got a bit of equity in them and they want to sell. So as they want to sell, the properties that they’re going to have potentially have not had much work done to them in the recent years, they’re tired, they’ve been tenanted, tenants haven’t necessarily looked after them as much – those are great flip properties. Now, the difficulty with the existing landlords is that they’re investors themselves. They tend to want the best possible price. We’re going to have to negotiate on the price. They also slap on magnolia, put some cheap carpets in and think that that’s refurbed to get a higher price and we all know that’s not true. So with existing landlords what you want to be doing is you really want to be, maybe looking to do something with them in terms of a joint venture, maybe an assisted sale, an opportunity to, maybe, agree on an option basis but then have a profit share at the end. You can do the profit share whichever way you want, 50-50, you can have it 70-30 to you. It doesn’t really make too much difference. And if you’re doing this for yourself, that’s a very good way of doing it. If you’re doing it as a sourcer, then not as appealing deal. So just be weary, if you sourcing for yourself, that’s a very good creative way of getting some extra deals. If you’re sourcing the deals on, so if your packaging and selling those for a fee, doing anything JV with a landlord, the existing owner is less appealing. So just bear that in mind just because the relationships, they don’t really know each other. So existing landlords are great, again, you’ve got items such as the HMO list, you’ve got accredited landlord lists, depending on the councils where you’re listening in. Also, you’ve got RLA meetings, NLA meetings, all these places that you can go, meet existing landlords, go and have a chat with them, see if they want to sell. And again, another good one, phone letting agents and just speak to the letting agents and see if they’ve got any landlords that might be willing to sell their rental property. Especially at the moment for the next couple of months, they’ll be a lot of void – properties with voids. December and January – if properties haven’t filled, the chances are that they might be empty up until the end of January. A landlord might just be open to having a discussion about selling the property. So existing loads, really good one. Now, it’s been mentioned in the Facebook group, and it’s a very good one as well – is unsold auction lot. So auctions. The best way to do this, get a list of all the action sites in your local area. 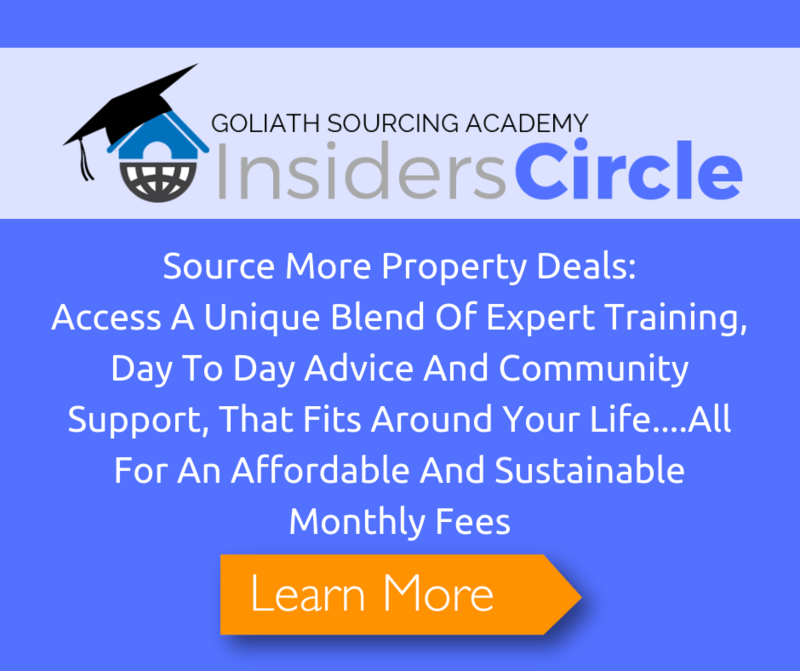 So auctions where they have properties within your area, your chosen area to invest. Make sure you sign up to their mailing lists. And what they’ll often do is send you out a catalog before the auction and then what they’ll also do is send you out an unsold lot. So they’ll send you a catalog just showing you what prices were achieved, but it will also have the unsold lots. So those are particularly good properties to target. Again, I’d start by trying to build a relationship with the auctioneers, the auction house. If you can’t do that, if they’re awkward, if they’re not being very helpful, then just do the direct mail strategy. Find the address, write to the address, hope that the owner picks up the post and see if you can agree something directly with them. So unsold lots, target that. Work with the auctioneer first, if that doesn’t work, target the properties directly. And another big one, slightly more difficult to do, but a very good one to get leads once you’ve established a relationship – probate solicitors. So probate solicitors quite often deal with properties that are in need of a lot of work. They’re going to struggle to achieve the price that maybe the beneficiaries are looking to achieve. They might want a bigger cut of the pie, slice of the pie, so to speak. So probate solicitors is a great one to try and work a relationship with them, really with a probate solicitor. It’s not about compensating the probate solicitor. What it’s more about is serving their client, serving their client best. So always look for the win-win. Things such as assisted sales, exchange with delayed completion, short term lease options where you can get in and do the works and then resell. And then again, similar to landlords, profit share at the end. Just make sure that they’re getting a good deal for the price but also then potentially a share of the profits as well. Again, better if you’re on your own. If you’re sourcing that deal it might be a little bit more difficult. So that gives you a few ways to source flips. I’m conscious I’m speaking very quickly today because there’s a lot to get through in this session. So just to conclude, unsold auction lots, probate estate agents, landlords, letting agents. There’s less opportunity, so you’re going to be – there’s going to be more competition. So you just need to make sure that you’re putting that effort in, building those relationships, on Rightmove all the time. Set up your alerts on Rightmove, Zoopla, OnTheMarket. Remember, some agents don’t advertise with all the different portals so make sure you’re signed up to all the different portals. A very important thing to remember, do not let deal desperation get the better of you when you’re negotiating on flips. You can often get quite excited about nearly being it a deal and you’ll keep increasing your price for the property just to get a deal. Do not do that. Flips – the numbers are so important on flips because that is your profit that you’re negotiating away. Again, it’s a much more risk, it’s a risky strategy because you obviously dependent on the property selling in order to make the profit or your investors to make the profit. So just make sure that there’s an emergency exit strategy. So if it doesn’t sell, are you going to be able to just take out a good chunk of your money on refinance and then maybe hold it for twelve months and rent it out? Just make sure there’s an exit strategy just in case. And just remember, be very careful with your refurb estimates, your resale values because that is what’s going to make the difference between a profitable deal and, heaven forbid, a negative amount. So you just need to make sure you’ve got the numbers correct. You’ve checked the refurb estimates are good. The resale values are realistic. Don’t go for an overvalued property. Go for a realistic value. And if you stick to all of those, you find the deals, you will find some very profitable flips and you will have a very good 2017. So hopefully you’ve enjoyed that. As always, have an awesome Christmas and New Year and again, for everyone, for 2017, happy sourcing. Brad: Hello and welcome to “In the Lab with Brad”. In this episode, what exactly is SEO and how to get started doing it? Now there’s a lot of misunderstanding and confusion that surrounds SEO. So in this “In the Lab” I’m going to try and untangle some of the myth and mystery and give you a foundational understanding of it in as plain English as I possibly can. Now let’s kick off with a basic definition. It’s actually a lot simpler than you may have first thought. SEO or search engine optimization is the name given to the activity that attempts to improve your search engine rankings. When you Google something, you get search results. There are two types of results. You get paid and organic. Now the paid results or Ad Words ads you’ll see generally as the top one to three entries and the bottom one to three entries on the search results page. They’re also characterized by little green or yellow square with Ad or AD in it. Sandwiched between the paid ads, you’ll see the organic results. The practice of SEO generally refers to these organic results. Google shows the organic results as it links to pages it considers relevant and authoritative based on the search term or the keyword. So how does it decide which pages are relevant and authoritative? It measures the authority and relevance of a page primarily by analyzing the number and the quality of links from other web pages pointing to it. Now I can’t remember where I read this, but Larry Page and Sergey Brin, the founders of Google, came up with this concept based on the idea that white papers written by academics and suchlike on various topics would include citations from other white papers. It was considered that the more citations a particular white paper had, the more important, relevant and authoritative it was considered to be. So simply, your web pages have the potential to rank in Google search results as long as the pages link to them. I’ve simplified things significantly here. In reality, the Google search algorithm is massively complex and includes hundreds of different ranking factors. There are teams of incredibly smart people over at Google that spend all day every day constantly tweaking, changing and updating the algorithm with the goal of ensuring that the search results served to its users are as relevant and useful to them as they can be so they keep coming back and keep using the platform. The next question to answer then is how do you get other people’s web pages to link to yours so that you appear higher up in the search results? Well, great content encourages people to link to your pages, which sends a message to Google that your pages are interesting and authoritative. Give Google what they want and you are good further way down the path to search engine success. So as I mentioned before, Google wants to show their users useful, relevant and interesting content. There’s another significant factor Google considers when deciding where to rank your pages. It’s become more important over the last few years as social media has exploded. This factor can be summarized using the term “social signals”. So when you write and publish content, if people find it useful, it gets shared in blogs, Twitter feeds, Facebook and so on. Now over time Google picks up on these authority signals and ranks those pages accordingly. I always think the marketing legend Seth Godin said it best. He said, “Create content that is remarkable.” Now what he meant was that you need to produce content that people want to actually remark on. So do that and people will link to it and share it and so the virtuous circle begins and your rankings will begin to improve. Now the word of warning – don’t confuse the quantity of links with the quality of links. It’s vital to understand that having great content massively increases your chances of securing natural links from quality sources. These are the links that will help you the most. The days of buying cheap links from places like Fiverr and those other kind of outsourcing sites, they are well and truly behind us. So creating great, relevant, authoritative, shareable and remarkable content is the fundamental foundation of any SEO strategy, but creating great content is one thing, getting Google to realize that it actually exists and indexing it correctly is another. Let’s get into one more layer of detail here. Let’s assume that you’ve created a few pieces of content that you’ve uploaded to your website. Now your attention needs to turn to what’s known as on-page SEO. Now this is the practice of optimizing each individual web page in order to rank it higher and hence get more clicks in the search results. So to understand on page SEO it’s worth a quick explanation as to how Google gathers info about pages on the Internet. Now essentially Google is a massive database of websites and their related web pages. Now there are of course billions of pages in Google’s database and in order for that database to exist, Google must find them and index those pages. It does this using what it calls Google bots. Now these bots, or often known as spiders, crawl the Web discovering new and updated pages to be added to the Google index. As the spider crawls over one of your web pages it reads information about the content on the page and then follows links to other pages within your site. This is what it means when a site has been crawled. Now the info that the bot collects helps Google to understand what your web page is about. So it stands to reason that it’s up to you to ensure that the info that’s on your web page clearly communicates the content that’s in it. That’s what on-page SEO is all about. Let me give you a quick list of everything you really need to consider when you come to optimize your web pages for search. As a free download, I’ve included an infographic showing you the on-page factors that you need to be considering. It’s called the on-page SEO infographic checklist. So go to goliathsourcingscademy.com/session16 to get a copy of it and you can use it as a checklist when you create a new page and also when you’re ready to optimize your existing pages. For now, I’ll just pick out the most important and the simplest ones to implement. So first up is keyword-friendly URLs. In your page’s URL, you’ll want to include some of the keywords that best describe what the content of the page actually is. Secondly is the title tag. This is generally considered to be the most important on-page SEO element. The title tag, again, needs to include the keyword most relevant to the subject matter on the page. You can actually go and find the title tag of a page by hovering over the tab on your web page browser. Thirdly, the H1 title tag. This is basically the title of your page that the visitor sees, i.e. it’s your headline. And you need to have keywords in your headline which are relevant to the content on the page. So fourthly and second from last is keywords in the first 100 words. So putting your keywords early on in the text of your page emphasizes what your content is actually about. And finally using social sharing buttons. I mentioned earlier that Google is placing more and more emphasis on social signals. So by placing these social sharing buttons on your page, you increase the likelihood of someone sharing your page or post and that sends the right signals, the good signals off to Google. So SEO’s a massive topic and it’s deep and it’s broad and we’ve only really touched the surface of it here, but hopefully this should give you some good introduction or foundation understanding of what it’s all about. Now if you have any specific questions about anything that I’ve talked about here, please post them in the Facebook group. I’ll be more than happy to answer them and even take a look at your website to see how you might be able to better optimize it for search. Where should we send your copy of the Flip Calculator? Where should we send your On Page SEO Infographic Checklist?